Once in a while, we see a person go out of their way to help another and we think, ‘oh, that was nice of them.’ Once in a while, we witness a selfless act of kindness that makes us want to be a better person, so we schedule a day to volunteer for the less fortunate. We try to do good deeds, but we wait for a better opportunity or when we have more money, or more time, to actually do a good deed. Eventually, we forget to do any good deeds until it becomes a thought again. When is there a good time to put someone else’s needs before our own? Do we wait for the holidays or for a perfect opportunity to show compassion to mankind? Do we wait for the right moment to give because we just don’t have the resources available? Or do we have limited time to think of another’s needs before we even perform any generous acts? When is the right time to show compassion for another? When did we lose the compassion to be a person who helps? Well, Lou Xiaoying did not wait for a perfect opportunity to save over 30 children from the face of death. She selflessly took in over 30 children who were left to die and raised them as her own even though she had very limited resources and was poor. For Lou Xiaoying, she did not think about the limited resources that she had or that was homeless. She did not think about the future or what she would do once she saved the children that were thrown in the trash. Her only focus was to rescue the children that she found while she was rummaging for food and gave them the love and devotion that many choose to withhold for a better day or opportunity. Lou Xiaoying is our modern-day guardian angel, who selflessly protected the children she found and gave them a home with lots of love. She did not have money to give and there were no good moments that she had to help, but she did anyways. She gave her life and devoted her time and love to raising the rescued children the best she could. Lou Xiaoying gave over 30 children the one item that money or any material items could not buy, and that was the love of a selfless woman. In 1972, while Lou Xiaoying was out looking for any trash that she could use, she discovered an abandoned little girl that was left as trash. She immediately took the little girl and gave her a home. As the little girl grew, Lou realized the capacity to care for children was abundant and continued to rescue children from death, one child at a time. As the years passed, the number reached over 30 children who were abandoned by their parents, left as trash on the streets of eastern Zhejiang, in China. Now, at the age of 88 years-old, Lou Xiaoying is suffering from kidney failure, laying in a hospital bed with little energy to talk or move. Fortunately, her acts of generosity, selfless acts of love and compassion, will continue with her family and friends. Hopefully, society will see that helping a person does not mean that you need money to help another. All you need is compassion. Compassion could make a difference in another person’s life. One of the most compelling parts of Lou Xiaoying’s story is the power of love that she gave to another. She devoted her life to bettering the lives of others. She gave what little she had and made the rescued children wealthy with love. Even at the age of 88 years-old, dying from kidney failure, she still continues to put everyone else before herself. This is a true story of a guardian angel that saved the lives of many and chose to better the world, by helping the children who were left behind. Please share this story with anyone who doubts the good of people in this world and wants to help better the lives of the children in our society. 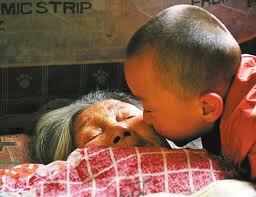 Help them believe in the generosity, kindness, and love for mankind that many still have and many still practice. There is never a perfect time to give or help another. There are just people like Lou Xiaoying, who put the love for children first in her life. This story shows that there are truly generous, selfless, giving people that live in this world and devote their lives to performing good deeds and generous acts of love. A child that talks too much usually receives negative feedback with this behavior. ADHD usually gets added to the feedback. Is your child really ADHD? Many people spend countless hours upon hours looking for ways to make money or find a way to save more money. Do you want more money but can’t seem to find any in your pocket, your bank account, or under your mattress? Since she was generous, I guess your next step is to raise money for her failing kidney?